Like anything else, becoming a good writer requires practice. There are no rules for how to practice, but sometimes a little direction feels nice. Books and websites filled with writing prompts help, and there are contests and other challenges that are easily found as well, but far too many of these “services” cost money. I’ve thought for a while that it would be a great resource for writers to have something to inspire practice; an outside source of inspiration and challenge in order to build up those writing muscles. Then I came across the Writerly App. The Writerly App is free and available for iPhone and iPad only at the moment, which is my only argument against the app. Otherwise, Writerly is a fresh take on writing assistance software. They are a self-advertised “one-stop source of inspiration and information to get your ideas flowing.” It was developed by award-winning fiction writers, creative writing instructors, and literary consultants. 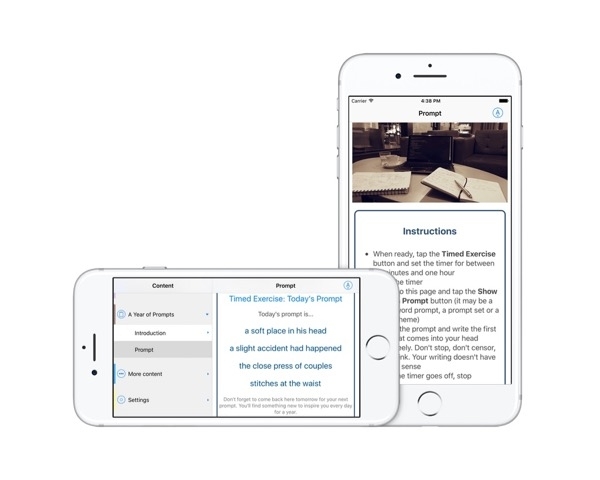 The app is filled to overflowing with prompts, information, and guidance for writers of any level of experience. Writerly takes a fun approach toward developing your writing while using an educated background. The entire app is built on the concept of writers working with two fundamental elements during the writing process: Creativityand Craft. Creativity is the basic flow of ideas, the burst of inspiration, the transformation of thoughts into words. Craft is taking the work accomplished during the creativity phase and analyzing it, transforming it into a developed piece of writing that is more enjoyable to the readers. Writerly acknowledges this mental struggle between creator and editor in the writer’s mind. By separating these concepts, Writerly aims to improve your writing by offering exercises, games, and quests in order to help stimulate your inner creator, and then offering other exercises to help you get the most out of your inner editor. The app blends these exercises together in order to get these two parts of your mind to cooperate, the result being an improvement in your ability to express those amazing story ideas you get on a daily basis. There is no restriction on who would benefit from writerly. It is an open-ended app. The app does not offer a word processor, meaning it does not force you to be restricted. If you prefer to type in Word, you still can. If you prefer to use a beautiful fountain pen on expensive parchment, the app still works for you. It is intended to accompany your current preferred method of creation, not replace it. Part of Writerly encourages you to abandon the keyboard in favor of pen and paper, and I find the reasoning interesting. The creators argue that our electronic devices connect us with other people on a constant basis. We are often interrupted by other things and other needs when we are using a phone or computer as a creation tool. Paper, they argue, allows us to have a direct and uninterrupted connection with our own thoughts. Additionally, electronic devices have delete buttons that are far too tempting to use during the creative process. Deletion is technically editing. By writing with pen and paper, the writer still has access to his or her “mistakes,” just in case they become useful later on. They call using the delete button “censoring your work in its early stages,” which is a painful yet glorious truth to learn. It makes me wonder what ideas I’ve errantly tossed aside while creating. The creator’s request to use paper is quite specific, actually. They suggest getting three notebooks: one legal sized, one half that size, and one that can fit into your pocket. The large notebook is for ongoing projects, such as stories, projects, or all of your writerly exercises. The medium notebook is for notes and quick ideas, or even dreams and random thoughts. They recommend keeping this notebook at the bedside. The small notebook is so you don’t miss any random inspiration or fragments of ideas while away from your writing spot. 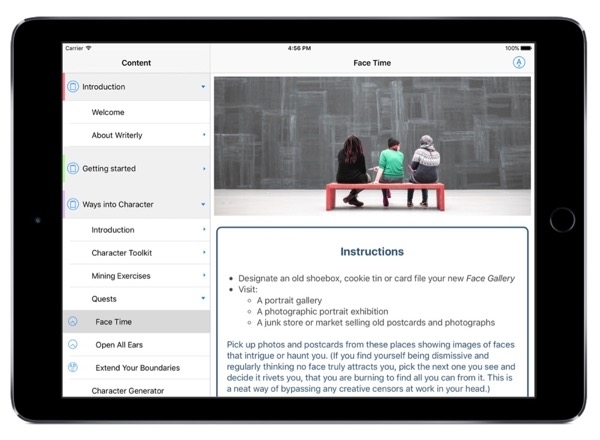 Writerly App is a free app with a noble cause: to inspire and hone the craft of writing in anyone interested. It is well organized, easy to use, and the information and exercises are supported by years of experience. I plan on using the app as often as possible, as it will only serve to make me better at my craft.